This is a place I use to organize my thoughts. I'm currently living in Seoul and keep this blog to document life out here along with my own personal interests. I'm not a big smoker, nor a big drinker, and while I may have experimented when I was younger, thankfully I never fell into anything too self-destructive. However, no matter how infrequently I partook in these I realize that health is paramount. That and my desire to pursue a habit of distance running somehow managed to lead me into the wispy world of vaping. Expats tend to be cut from a similar cloth. We tend to be relatively young, and adventurous, but otherwise we come from a variety of different backgrounds. To this day, when traveling I enjoy staying in youth hostels simply to hang out with the different sorts of expats that pile in from all around the world. However, occasionally I have come across a rarer breed of expat that lives abroad not necessarily just for the thrill of it, but for economic and political reasons as well. People who would be nearing retirement age while still abroad could have benefited from this book. However, it is quite useful for an expat of any age that is interested in investing, or in a pension, but doesn't exactly know how to go about doing it. Let's admit it... We're all children at heart, and every time this amusing, massive, rubber duck finds its way on to my news feed or crosses my line of sight while browsing reddit I can't help but giggle in a manner quite unbecoming of a grown man. 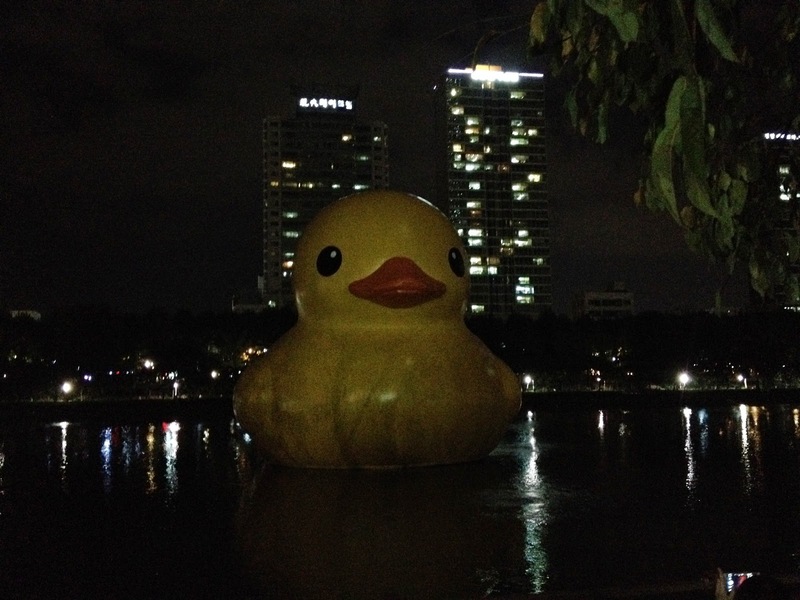 The duck was made by a a Dutch artist and has been touring the world since 2007. The duck is said to be for the purpose of healing distress and relieving tensions, and for anyone who knows anything about Korea, that is something that is desperately needed here. 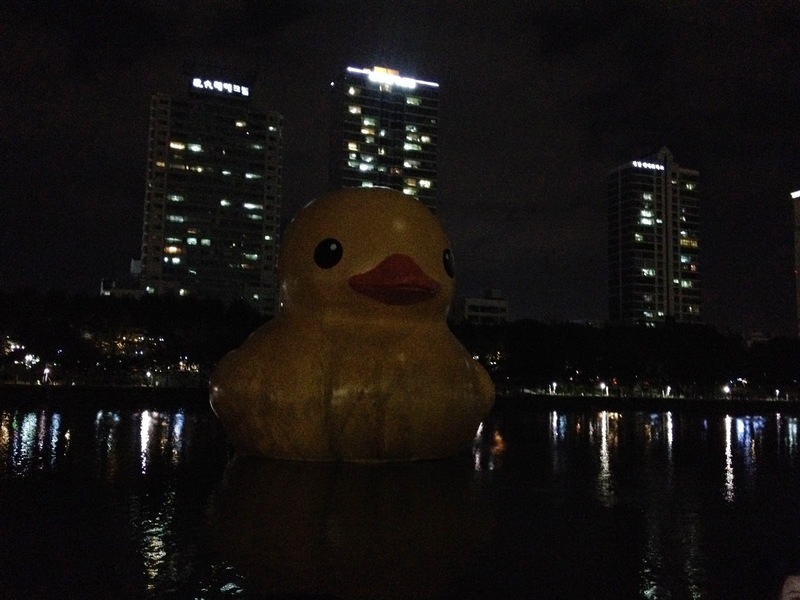 I used to go running nightly at Seokcho Lake where the duck will be displayed for a month. I will be happily returning as often as I can manage just to enjoy the outright silliness of it all. Cheers!... uh, Quack! I had to go back in the daylight too. Thankfully there weren't as many gawkers as I had imagined. It was actually pretty calm and peaceful, but I don't imagine it will remain that way for long. Also if someone wants to make some serious cash they should start selling normal sized rubber ducks, duck calls, and roast duck on location. I'm amazed that despite the fanfare no one thought of this. the deepest of quacks in my presence. I am an American expat living in South Korea, I speak four languages poorly, and have traveled to and in over 10 different countries. My interests are broad, and varied. I constructed this blog as a means of organizing my thoughts, and hopefully providing information for those who see it.